Funny! We have 4 dogs, and the ringing of the door bell or a knock on the door is cause for great concern among them. 🙂 We live in a neighborhood that is very diverse, politically active, as well as having several churches, mosques, ect. within a few blocks from us. 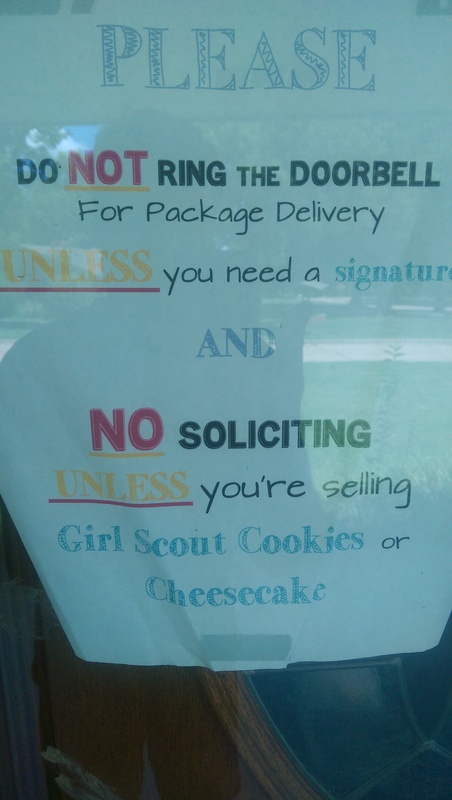 So our signs says, “Please do not disturb, be it political, religious or otherwise (unless you are selling Thin Mints). Thank you. Por favor, no molestar. Gracias.” We have far more than just Spanish & English speakers in our neighborhood, but I didn’t want the sign to encompass the entire door. Those mid-westerners are there to help! BTW, I love the “cheesecake” part of your sign. I love your stories and your blog, Caspar! This one just shows how weird people can be sometimes! A real howler!! Thanks for the perfect laugh before bedtime!! !